The typical size of newly built single-family homes was effectively unchanged from the first to second quarter of 2015, posting small quarterly declines. The current data is consistent with the general trend of flat growth for the size of typical newly-built homes, a pattern that took hold during 2014. As first-time buyers return to the market, typical home size is expected to trend somewhat lower. According to second quarter 2015 data from the Census Quarterly Starts and Completions by Purpose and Design and NAHB analysis, median single-family square floor area fell from 2,519 in the first quarter to 2,479 square feet. Average (mean) square footage for new single-family homes fell from 2,736 to 2,714 for the second three months of the year. On a less volatile one-year moving average, the recent trend of leveling home size can be see on the graph above, although current sizes remain elevated. 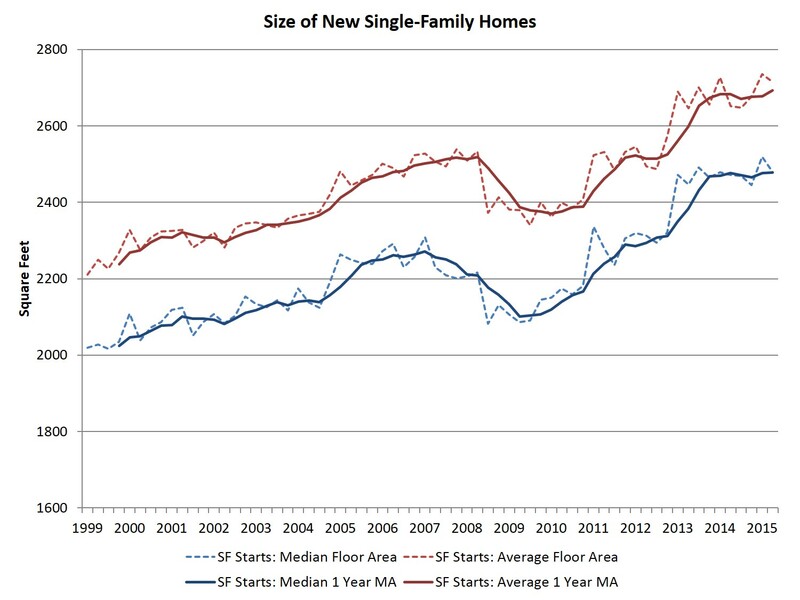 Since cycle lows and on a one-year moving average basis, the average size of new single-family homes has increased 14% to 2,694 square feet, while the median size has increased 18% to 2,478 square feet.